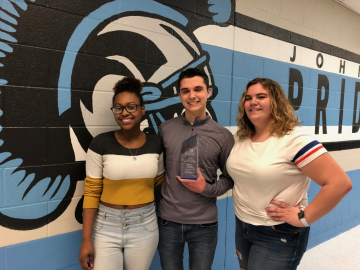 Greater Johnstown High School Key Club and Interact Club has provided over 30 service projects every year that directly impacts the community. Examples include the “I am not Lost” placement of warm winter wear throughout the community, the library boxes in each neighborhood which brings literacy to families without transportation to the library or have funds for books. The schools sport teams has completed multiple projects from reaching out to senior citizens, packing backpacks for weekend food security, to the assembly and dismantling of the tree in our Central Park. Students pick up trash in the the community and plant flowers in three specific areas every year for the previous ten years. They also walk for peace every year in the city and provide their teenage vision to Vision 2025. The schools vocational programs weld grave markers for local VFW and cemeteries and they built a ramp so veterans had access to the local American Legion. Students in all three schools built and maintain a house in the Christmas Village at Central Park and they paint the windows of the town for the holiday. The art students provide murals in a variety of locations from the city garage to providing camouflage to a door at a nursing home that Alzheimer residents kept using to elope. Here is a link to their award video. List of Cambria Regional Chamber’s Annual Business Award winners.